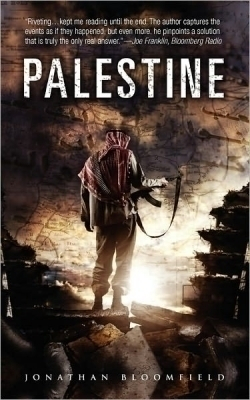 Palestine is a tense, exciting, and timely political thriller that is as entertaining as it is engrossing. Set in the present it presupposes a conspiracy fostered by Iran to use the Palestinian Hamas and Lebanese Hezbollah resistance armies to smuggle in and set off nineteen small nuclear devices in Israeli cities. To complete this cleansing of their land, the resistance prepares a conventional ground attack that is to culminate in the slaughter of every Jewish man, woman, and child. This is to be genocide on a scale beyond the Holocaust; one as thorough, as devastating, and as merciless as that perpetrated by Joshua on the original inhabitants of the Promised Land. Writing in a style highly reminiscent of Tom Clancy, Jonathan Bloomfield populates his novel with decisive heroes, despicable villains, genius techies, greedy bankers, courageous soldiers, clue-less cops, corrupt officials, gutless politicians, clever intelligence officers, some nasty perverts, and even a few pretty girls. The requisite cast is neither unique nor surprising. Most are solidly one-dimensional, but one or two are refreshingly and thankfully quite human. Chief among these characters, oddly enough, is a captain of the Palestinian commandos tasked with planting a nuclear bomb. What makes this choice odd yet brilliant is that Bloomfield’s prose is otherwise entirely, unapologetic, unswervingly, and devotedly pro-Israel. Bloomfield does the same with his Arab villains, and thus gives the reader a solid insight into the mentality that drives both sides in what has become a long and sad exercise in mutual suicide. Thankfully the author moved most of the pro-Israel rhetoric to the appendixes. Setting these lengthy, deadly, one-sided, and even at times infuriating political passages aside allows the other 340 pages to breathe, and to run, free of the encumbrance of 140-plus pages of dead weight. And run it does—and brilliantly. This is a page-turner and a fast, easy, and rewarding read. A few pits and bumps here and there slow the pace and weigh down the story, but these are thankfully brief, and after a few such stumbles the action and plot resume at high speed. In many ways Palestine is not only just a techno-terror thriller but also a modern spin on a Cold War classic. Israel and Iran both possess nuclear arsenals, points out one government minister, and thus under the Cold War doctrine of MAD (Mutually Assured Destruction), this fact should prevent either side from initiating a war that could bring about each other’s extermination. The prime minister scolds that here in the Middle East MAD does not apply; in his view the Iranians would welcome a nuclear holocaust as a religious victory, as it sends Jews to hell and Iranians to heaven. While many could argue that much of what Bloomfield’s characters say is bigoted, biased, and even blatantly untrue, none of that should detract from the enjoyment of the story. If anything, Bloomfield’s exaggerations allow the reader the comfort of a good summer read, where the bad guys are very, very bad and the good guys, while at times cold and brutal, are at least easily identifiable. To his credit, Bloomfield does conclude his novel with a pitch for peace—albeit on Israeli terms. Also, whether he intended so or not, his best, most believable, most human, and most sympathetic character is a Palestinian – the very commando charged with deploying a nuclear bomb. Politics and bias aside, Bloomfield’s plot is credible, his characters believable, and his action unrelenting. It is a damn fine and damn frightening read.